8:00am: Woke up in Montreal and put my new favourite chupa on with a white shirt (whonjoo). LHAKAR! 9:00am: Gen from SFT Montreal came to pick us up in her car and we all headed to Uniprix Tennis Stadium to prepare to table for SFT at Kundun’s public talk. LHAKAR! 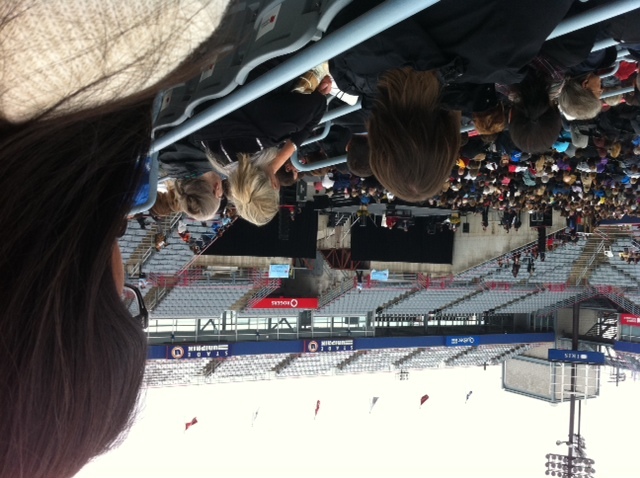 1:30pm: His Holiness the Dalai Lama entered the stadium nearby where we were tabling so we were able to go welcome him as he stepped out of his motorcade. 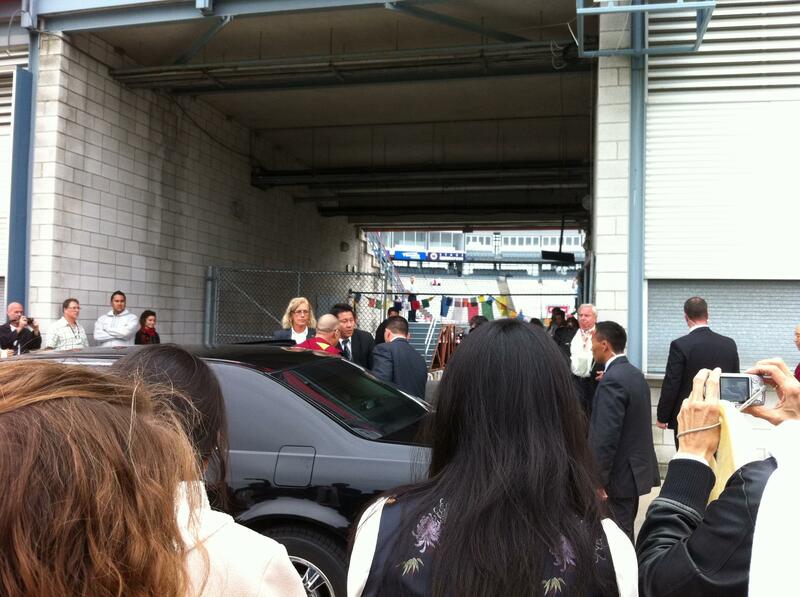 He faced the small crowd that had gathered to welcome him and waved and smiled to all of us. Maybe I have bad eyes, but I could swear we made eye contact. I felt content. LHAKAR! 3:30pm: It got crazy again at the SFT table. People seemed to be even more interested in hearing about our work after listening to Kundun’s talk. 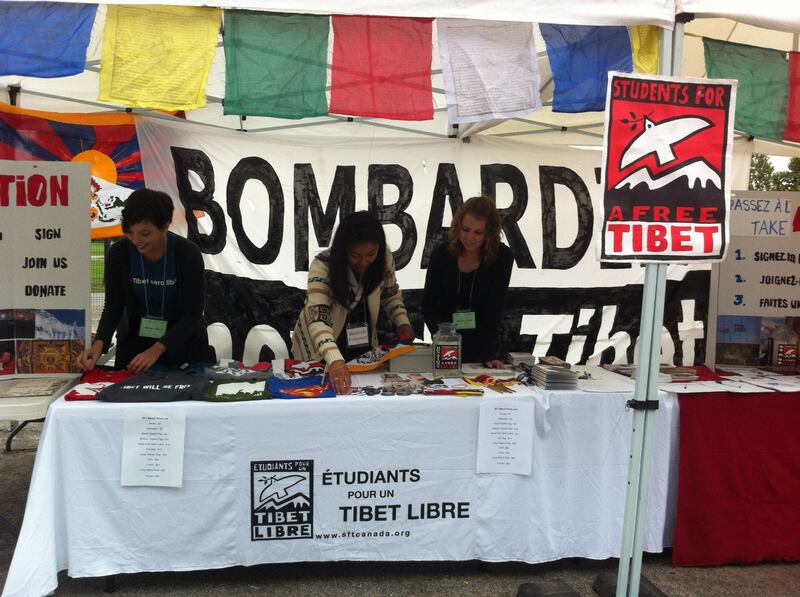 Not only did I get to practice my French, but my Tibetan as well! LHAKAR! 5:00pm: After taking down and cleaning up our table and tent, I met up with my family who had come for the talk as well. They fed me and my SFT friends from a tiffin they brought from home containing channa, alu pingsha, rice, and bhaklep – a very Tibetan-parent thing to do :p They also had bhoeja! LHAKAR! 10:00pm: I’m now trying to keep my eyes open and force my fingers to keep typing as I finish writing my Lhakar Diaries post after this incredibly eventful and tiring day. I’m sure there are more “Lhakar-ish” things I’ve done today since I recall shouting out “Lhakar!” a lot out with my friends every time I did something that could be considered a Lhakar action. I am now posting my Lhakar Diaries entry for the week, and wishing every Lhakar could be like today. LHAKAR!